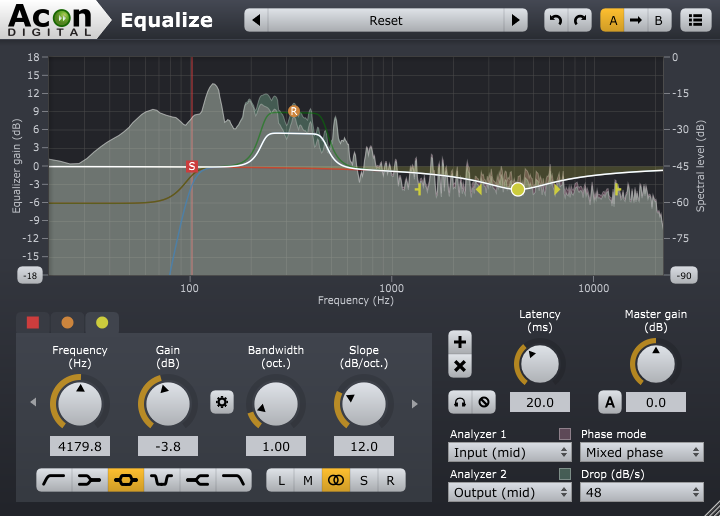 Oslo, March 18th, 2016 – Acon Digital have released version 1.2 of Equalize, their award winning parametric equalizer plug-in. The new version supports the VST3 standard and offers improved ergonomics as well as a more polished visual appearance. Tab buttons in the user interface give quick access to band specific settings. The visualization of the filter curves now indicates bands in solo or bypass mode. Holding down the alt key activates a cross-hair cursor with frequency and spectral level readout. Additionally, the spectrum analyzer has been improved with interpolation and a new spectrum hold mode. Acon AS was established in 1987 and offers award winning products and consulting services with a strong focus on digital signal processing and audio processing. The company offers high quality software for digital audio editing, audio restoration and mastering. Acon AS took over the audio editing and processing product line from the German company Acon Digital Media GmbH on January 1, 2012. Acon AS will continue to develop and support these products in the future. You received this email because you registered an Acon Digital product with unknown@noemail.com as email address. If you don't want to receive such emails from us in the future, please click here to unsubscribe. Copyright © 2016 Acon AS. All Rights Reserved.